I hope you've all had a nice, relaxing weekend....mine has been fabulous so far but today I'll be busy as usual!! My card for today is featuring the sketch from Jenn Balcer and I really love how it all came together! I used the same supplies that I had from the other day with the exception of the image...I also received this from SCS so my card came together very quickly!! Thanks Jenn!!!!! I better get busy.....have to finish up my swaps for tomorrow, get another swap ready to be mailed & start on laundry......such as life LOL! Thanks so much for stopping by and have a great rest of the day!! Wow that is a beauty!!!! I need to check out her sketches. Great job. What a great card! I love that bright, bold flower!!! Absolutely stunning card...the colors are so rich!! WOW! Jackie. You outdid yourself with this one - it's gorgeous! Holy Moly gorgeous! An absolutely wonderful card - love the colors, the layering, the images....well just everything about it. Thanks for the inspiration. Wow! This is gorgeous, Jackie! I just love this color combo, and the flowers just pop off the card! Wow Jackie this is fabulous and beyond. Love those colors and that image. Holy moly, these colors are AWESOME together!! They really pop off the page! 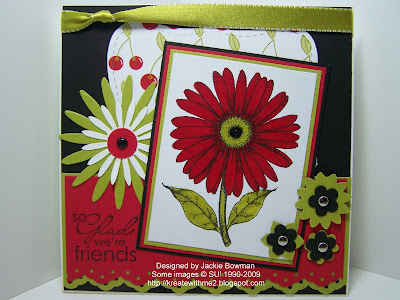 Love the border punch on the bottom, & all the punched flowers! The color on this flower is so vivid. Gorgeous card. Oh my goodness! This is a beauty. Love the colors, dies and design. Your image is beautiful. Stunning! I LOVE IT! The vibrant colors and layout really pop. A true beauty! Beautiful Card Jackie!!! Love the bright colors, dies and design!! Have a great day!! Beautiful card, Jackie! Love the rich & vibrant tone it has! Jackie this is gorgeous, I love how you pulled this together, and I love this red, black and green, it is rich with color. Jackie, this is gorgeous!! LOVE the colors. This is so beautiful! Love the colors and all of the flowers! I love this color combination and everything else about this card. Fabulous work!! Fabulous card...love everything about it...love those bold colors! I love how bright and fun your card is. The image is so pretty. I love the bright beautiful colors of this card! Wowzers!! This is a striking card, Jackie! Gorgeous! Lovely card, as always:) Wow colors! I LOVE this color combo so much so much. I'm inspired to have to use them this week now :) Beautiful card! WOWZER!! So so gorgeous!! Stunning coloring details!! WOW! Jackie, WOWWWWW!!! Is this ever GORGEOUS! I *love* Love* love* it!!! I love the vivid colors! This card is wonderful in every way!!! I really think it is one of my favorite cards I have seen anywhere in a long time!!! This is so so pretty!!! Love how the top note is hiding behind there too!!! OMG, Jackie...this is absolutely gorgeous!!!! I love the colors you used and the images are fabulous!!! Such an awesome sketch, too...I better go check out Jenn's blog!!! This is gorgeous Jackie!!! I love your layout and colors! Fab job!! Super gorgeous! Love these colors and the bright happy feel. Beautiful! Very cute card! I love the bright colors and the layout. This card is absolutely breathtaking...I love the coloring and the layout wonderful creation.